At the end of This Is Us season two, fans watched as Kevin and Beth's cousin, Zoe, met for the first time. The next thing viewers knew, Kevin and Zoe were seen in the near future as a couple heading to Vietnam to explore Jack's past. 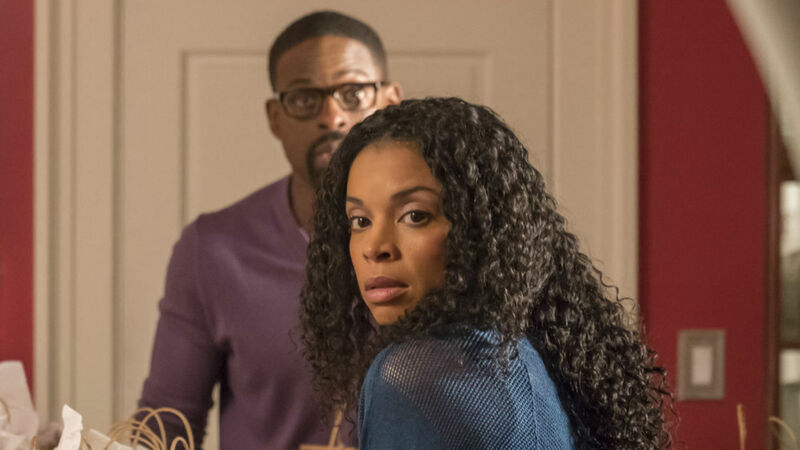 A new teaser for the third season dropped on Aug. 24, and Susan Kelechi Watson explains exactly how her character, Beth, feels about her brother-in-law having a romance with her beloved cousin. As fans can probably imagine, Beth isn't thrilled. "Kevin's on this trip with this woman he just met," Justin Hartley, who plays Kevin, is first seen saying. "It's Beth's cousin that he meets at the wedding." Hartley continues, "They just sort of hit it off, and we'll see where this goes. There's also a question of how Beth's gonna handle that." Per Watson, "She probably thinks it's not a good idea. To Beth, worst case scenario is they get together." Yeah, that sounds about right. It's no secret Beth isn't a huge fan of Kevin and all the times he's screwed up. For example, in season two when Kevin was dealing with addiction and drove while under the influence, not knowing Beth and Randall's oldest daughter, Tess, was in the car. Beth wasn't happy. So to learn Kevin is dating Zoe, well, it sounds like Beth is definitely going to have a strong reaction. On Aug. 23, The Hollywood Reporter announced Melanie Liburd, the actor who plays Zoe, is a series regular in season three. It sure sounds like Zoe will be around for a while and possibly play a major part in the series in addition to being a big influence in Kevin's life. Co-showrunner Elizabeth Berger previously told THR about Zoe and Kevin, "When we come back, we're going to be embarking on a new chapter with them sort of discovering their romance, and their relationship, and figuring out what they are. We can expect to see her for a while." Berger also said about Kevin and Beth's relationship, "Beth and Kevin have this fun dynamic between each other, and we just felt like Kevin dating Beth's cousin would bring up so much more fun stuff for everyone to play." Who knows what will happen with Kevin and Zoe, including whether they'll even last? If he ends up hurting her in some way, you bet Beth won't let Kevin walk away without at least a scolding. That said, let's hope along the way Kevin and Beth's rocky relationship will be at least somewhat mended and they can find some common ground. Maybe one of Zoe's purposes is to help Beth and Kevin connect and form some type of bond. Whatever happens, This Is Us season three already has us very excited.